The Architectwas the first book in fifty years to survey the role of the profession from its beginnings in ancient Egypt to the present. Without claiming to cover every period in every country, it is nonetheless the most complete synthesis available of what is known about one of the oldest professions in the world. Dana Cuff considers the continuing relevance of the book and evaluates changes in architectural practice and the profession since 1965, most particularly digital technology, globalization, and environmental concerns. 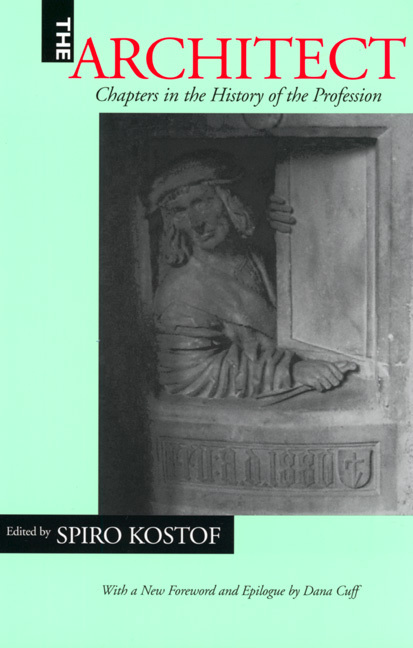 Spiro Kostof (1936-1991) was Professor of Architectural History at the University of California, Berkeley. Among his books are A History of Architecture: Settings and Rituals, second edition (1995) and The City Shaped: Urban Patterns and Meanings through History (1993). Dana Cuff is Professor of Architecture and Urban Design at the University of California, Los Angeles, and author of Architecture: The Story of Practice (1991) and The Provisional City (2000).